MOOCs have the potential to challenge existing educational models. Paradoxically, they frequently reinforce educational conventions by requiring the learners to conform to expected norms of current educational models. Recent research has produced data on how learners engage in MOOCs. And yet, despite the extensive data, rather than freeing learners to chart their own pathways, MOOCs still require the learners to conform to expected norms. The very act of learning autonomously often causes tensions, most noticeably when learners choose to drop out, rather than complete a course as expected, or when they engage in MOOCs as mere observers, rather than active contributors. In this chapter, we explore how the emphasis on the individual as active and autonomous learner sometimes conflicts with the expectation that learners conform to accepted norms. This expectation that learners conform to accepted ‘ways of being’ in a MOOC isolates those who plan their own pathway. The chapter concludes with a typology of different learners, arguing that, rather than adhering to a ‘type’, each MOOC participant moves across these learner types, depending on their motivations, and may span different types, rather than falling into one single category. Christensen, G., Steinmetz, A., Alcorn, B., Bennett, A., Woods, D., & Emanuel, E. J. (2013). The MOOC phenomenon: Who takes Massive Open Online Courses and why? Available from: http://ssrn.com/abstract=2350964. Conole, G. (2013). MOOCs as disruptive technologies: Strategies for enhancing the learner experience and quality of MOOCs. RED - Revista de Educación a Distancia, 39. Available from: http://www.um.es/ead/red/39/conole.pdf. DeBoer, J., Ho, A., Stump, G., & Breslow, L. (2014) Changing “course”: reconceptualizing educational variables for massive open online courses. Educational Researcher, 1–11. https://doi.org/10.3102/0013189x14523038. LeBar, M. (2014) MOOCs—Completion is not important. Forbes. Available from August 20, 2017: http://www.forbes.com/sites/ccap/2014/09/16/moocs-finishing-is-not-the-important-part/. 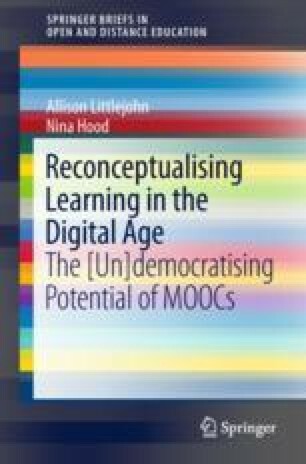 Littlejohn, A., & Milligan, C. (2015) Designing MOOCs for professional learners: Tools and patterns to encourage self-regulated learning, eLearning Papers, 42, Special Issue on Design Patterns for Open Online Teaching and Learning. Accessed August 20, 2017 from http://www.openeducationeuropa.eu/en/node/170924. Milligan, C., Margaryan, A., & Littlejohn, A. (2013). Patterns of engagement in connectivist MOOCs. Journal of Online Learning and Teaching, 9(2). http://jolt.merlot.org/vol9no2/milligan_0613.htm. Shah, D. (2016). By the numbers: MOOCS in 2016. [Online]. Retrieved from https://www.class-central.com/report/mooc-stats-2016/. Siemens, G. (2006). Knowing knowledge. [Online]. Available from www.knowingknowledge.com. Yang, D., Sinha, T., Adamson, D., & Rose, C. P. (2013). “Turn on, tune in, drop out”: Anticipating student dropouts in massive open online courses. In: Proceedings of the NIPS Workshop on Data Driven Education (pp. 1–8). Retrieved from http://lytics.stanford.edu/datadriveneducation/papers/yangetal.pdf.